The original prototype is shown on the right. The two resistors are 100ohm 50W thick film bolt down types and wired in parallel. See Farnell Electronic Components Ltd catalogue. Coax socket is UHF type SO239, BNC, N etc. as preferred by the constructor. 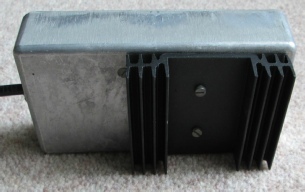 The heatsink is a finned type for use with TO-3 transistors like the 2N3055 with a centre gap in the fins which could be used to accommodate and protect the resistors and wiring instead of as shown. The fan may be 12v DC or mains operated with the appropriate wiring and safety precautions but is only needed if the dummy load is to be used continuously. Make sure that the overall structure is in free air and not covered. A small metal cover bolted to the heatsink may be required over but not touching the wiring to reduce radiation at very high frequencies. Up to 30MHz the reflected power is negligable. However, at 144MHz, 12W forward power gives 3W reflected power which is thought to be due to the capacitance inherent in the construction of the thick film resistors. 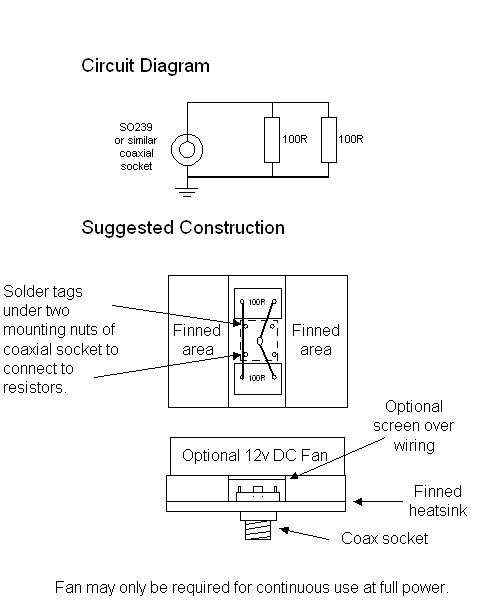 Alternative TO-220 types are available which may have a lower self capacitance. 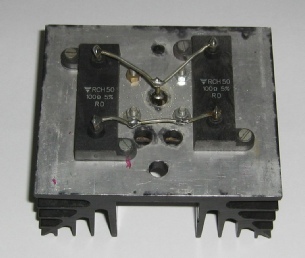 Inside and outside views of a repackaged version using the same resistors are shown to the right mounted in a die cast box for improved screening with a small external heatsink. This will handle 100W for short periods of time but is not intended for 100W continuous dissipation for which a cooling fan would be required. 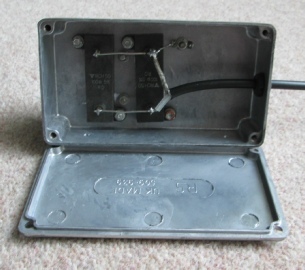 It will be mounted in the Z-Match elsewhere on this site and used for periodic transmitter checks.